Around two hundred secondary scholars in Loeriesfontein are learning more about the significance of renewable energy through a school programme initiated by Loeriesfontein Wind Farm and Khobab Wind Farm. The programme, entitled ‘Clean Energy, Brighter Futures’, aims to increase awareness about renewable energy, in particular wind energy; and to strengthen ties between the local wind farms and the surrounding community. 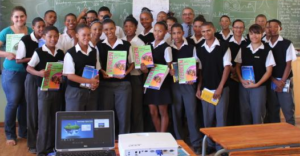 The wind farms have also funded a large purchase of Life Science text books for all Grade 10 learners. “It is important that learners understand what wind energy is about, how it benefits our country, the environment and specifically the local community,” said Leo Quinn, Project Manager of Loeriesfontein Wind Farm. The content of the programme is targeted at Grade 8 to 12 learners from the local high school, Hoërskool Loeriesfontein and fits into their Natural Sciences and Life Skill studies. Learners are exposed to the basics of renewable energy, how a wind turbine generates electricity and the need for renewable energy projects within South Africa, amongst other content. The objectives of the school’s programme include; education and awareness around wind energy; encouraging an interest in renewable energy career fields; helping learners understand the construction process and how their specific community will benefit from having a wind farm on its doorstep, both during and after construction.